Mevion is dedicated to making proton therapy a clinical reality and a business success at your cancer center. 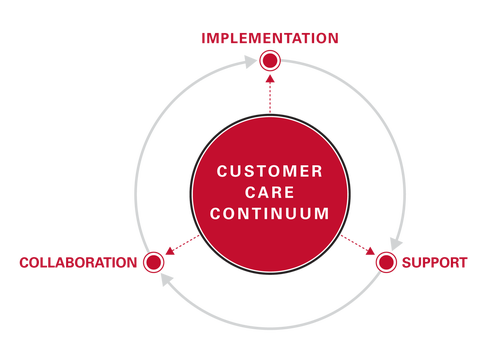 Mevion’s Customer Care Continuum provides you with dedicated services designed to deliver a superior customer experience, seamless system deployment, expedited commissioning, and rapid clinical ramp-up. Our proven track record successfully implementing compact proton therapy systems means we have a much faster execution time to help you start treating patients with your new system as quickly as possible. Mevion has implemented more compact proton therapy systems than any other manufacturer worldwide. Our typical cycle consists of a 10-month installation, 1 week acceptance, 6 weeks commissioning, and less than 3 months to reach full capacity use. The flexible and simple requirements of the Mevion bunker allow proton therapy facility construction projects to be approached similarly to any radiation therapy building construction project: one room at a time with one or multiple rooms installed in parallel or in series following the growth of the clinical practice, without disrupting the existing clinical services. For each project, Mevion provides a project site manager, an installation manager and a clinical project manager. Mevion provides a very comprehensive training process for physicians, therapists, dosimetrists, physicists, administrators, and hospital engineers conducted both onsite as well as at Mevion training centers. Sample courses include education for clinical machine operations, physicians, physics, ancillary staff and biomedical technicians. Once the system is clinical, we provide ongoing support services. Mevion’s maintenance and support services are designed to maximize clinical use and minimize downtime. Because the system design is similar to that of a linear accelerator, Mevion only requires maintenance and support on a quarterly and annual schedule, and can deliver 24/7 beam availability for clinical or research use. For customers who require advanced clinical services, Mevion offers a customized ramp-up and continuous improvement program. These consulting services are designed to ensure the facility site has the optimal efficiency and workflow, while at the same time ensuring staff are able to maximize the capabilities of Mevion’s advanced applications. Mevion’s commitment to its customers does not stop at implementation. Mevion looks forward to forming a long-term collaboration to further develop proton therapy as part of a comprehensive customer care continuum. Because of Mevion’s clinical innovation and smaller footprint, there are many more proton therapy facilities being considered and established by leading radiation therapy services. These developments will inevitably lead to new clinical treatment protocols and approaches, and Mevion is continuously seeking research partnerships. Washington University has developed a multi-center proton patient registry as well as clinical education programs to benefit all proton therapy centers worldwide. Although the patient registry is open to any particle therapy center that wishes to participate, as fellow Mevion customers, Mevion helps facilitate involvement in the registry to collect clinical data and patient treatment plans in order to better track clinical outcomes. Mevion believes strongly in the power of networking, from both a clinical and operational perspective. Mevion hosts routine user events, both virtual and in person, that bring together common groups (e.g. physicists, clinicians, and administrators) to further advance proton therapy delivery. These are events are complimentary – part of being a valued member of the Mevion community.